British indie-electronic duo HONNE is the happy ending of the story of two schoolmates who shared a passion for music, brought their talent together and uploaded an original song to SoundCloud. 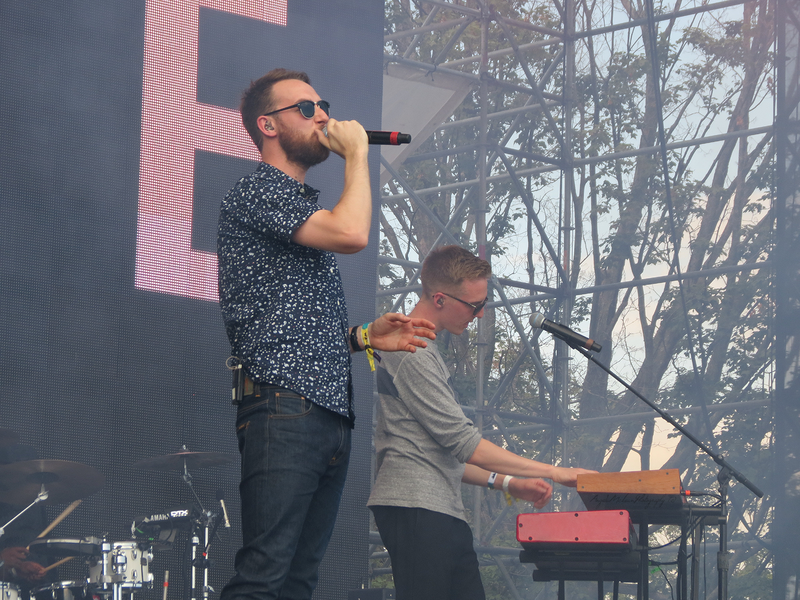 That song was HONNE’s mega-successful debut single “Warm on a Cold Night,” and for Andy Clutterbuck and James Hatcher it marked the beginning of a dream come true. Neither could have predicted that within a few years they would be playing sold-out shows and festivals around the world, have an extensive discography including several EPs and their LP ‘Warm on a Cold Night,’ and have famous fans and friends in SG Lewis, Mura Masa and Coldplay. After they hopped off stage, RUtv News sat down with HONNE’s Andy and James to chat about greatest hits shows, how a friend’s hangover inspired their album name and what’s next. Here we are at WayHome Music & Arts Festival! How would you describe your festival sets? James: I would say that our music is quite chilled out and very electronic but live we’ve always wanted to make it properly live and a bit more loud and exciting. So, we’ve got an amazing drummer, a bass player and a backing vocalist who hopefully bring spontaneity and excitement to the whole thing. You guys have played shows at The Garrison and Mod Club Theatre in Toronto. Do you form your set differently if you are playing a smaller show versus a festival stage? Andy: It’s a different thing all together in that at your own show everyone knows who you are. You play all of your old songs, the songs that aren’t as well-known but people still love it. Festivals are great too because we’re just playing to keep it as upbeat as possible. James: Yeah, you just play all your loudest, fastest songs. It’s like the greatest hits show. But then we have fans that say, “Why didn’t you play Woman?” or those fan favourites. Andy: That’s why you come to a show after! You released ‘Warm on a Cold Night’ around this time last year. Would you say that the album tells a specific story? Andy: It’s an account of our lives two years prior to when we released it. Going back to our name, it comes from the Japanese word ‘honne,’ which means true feelings. We’d already written about six or seven songs before we found that word and as soon as we began to write more it just made sense. We try to be as honest and truthful as we can through our music. The album title is derived from the title track. What about that line stuck out to you? James: It comes from one of our best mates who is also Andy’s girlfriend’s brother, and I used to live with him. If he got really drunk, the next morning he’d come downstairs and his voice would be crazily low. I was like, “We’ve got to get you to record a voiceover for one of our tracks.” I put different effects on an instrumental and made it sound like a radio. He came down later one night and was like, “Oh my gosh, my voice is going to be horrible in the morning.” So, he woke up at like 11 or something, really not that early, came downstairs and was like, [deep voice] “Hello James.” I was like, “YES! Get in here now.” He just freestyled loads of stuff and that’s how it all came about. Andy: He lives in Sweden now and he was talking with these two South Korean girls who were big fans. It all unraveled that he was the voice that started that song and they just went crazy! Do you have a favourite song off the album to play live? James: “Warm on a Cold Night,” “Good Together” and “Someone That Loves You”…any with sing-along moments where I can take my in-ears out and hear everyone else singing. It’s incredible. Your smash hit “Someone That Loves You” has nearly 30 million plays on Spotify. Were you expecting it to have that kind of response? James: Never! We’re both like hopeful pessimists or something. Like, I really hope everything is going to be alright, but realistically you just never know how people are going to react. Ultimately you’re like, meh, they probably won’t care. But then they do! It makes it so much more special. What songs have you ‘just dancing’ this summer? Andy: Everything Solange. Also, “All Night” by Chance the Rapper. James: “HUMBLE.” by Kendrick Lamar is a good one. You have a packed summer festival schedule. Do you have a go-to festival hangover meal? James: I’d say something from Whole Foods. I get a smoothie called Farmer’s Garden. It’s green and it’s got a lot of lettuce and stuff in it, but it’s a tasty one so it’s still got strawberries and bananas. I also load up at the salad bar. Andy: I need something really unhealthy! I’ve been to Glastonbury Festival quite a few times and I come home after very hungover, and they have this amazing thing in London called Pieminister. They’re the best pies with mash and gravy. If you’re ever in London, go! While we listen to “Just Dance” on repeat, can you give us any preview of what to expect from your sophomore album? Andy: We’re aiming to have an album for the beginning of next year. You’ll hear another one or two songs before then! We’re working with a bunch of new artists and if you’ve been on our social media you’ve seen stuff. They may not all be on the album but maybe for other things. James: For this album, we want to work with not just other artists for collaborations or whatever but just musicians that we love and have respect for. It’s all exciting. 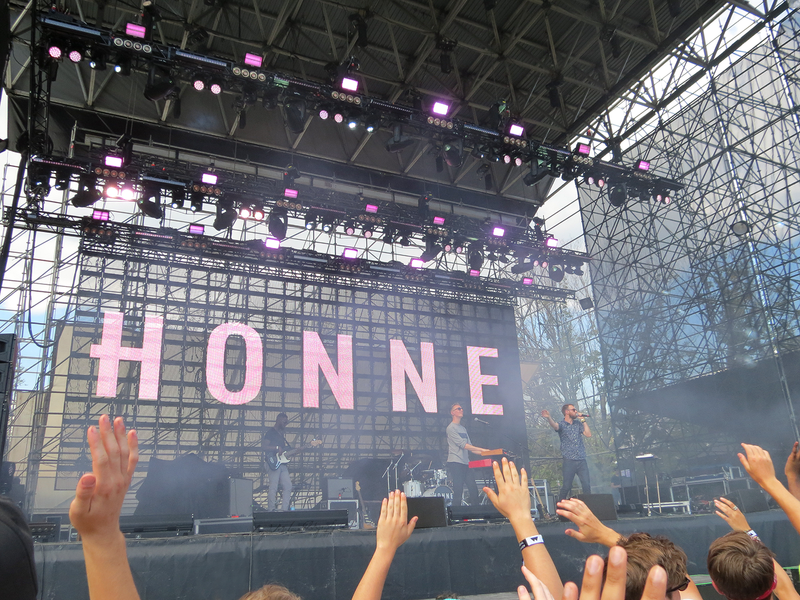 Thank you, HONNE! The duo’s summer single “Just Dance” is available now on iTunes and Spotify.